Mazda’s rare and innovative Cosmo is little known outside the mildly obsessed world of rotary-engine enthusiasts. Diminutive and exotic, the model is largely ignored in comparison with its Toyota 2000GT and Honda S500 Japanese sports car contemporaries. Yet the Cosmo Sport very much encompasses Mazda’s engineering-led, convention-defying approach to cars that’s still evident today. Building on the concept of the Wankel rotary engine, the Cosmo was Mazda’s first rotary car. It created a legacy that endured right up to the RX-8. That the Cosmo arrived just seven years after Mazda’s first passenger car is remarkable. It was built between 1967 and 1972 in the manufacturer’s Hiroshima plant in Japan, at a rate of one car per day. Two types would be produced: the original 110S, with some 343 built, and the Series II, which came along in July 1968. Of the latter, 1176 left the production line. To prove the efficiency of its pioneering engine technology, Mazda entered the Cosmo in the 1968 Marathon de la Route. The gruelling 84-hour event held at the Nürburgring would be Mazda’s first endurance race. Two Cosmos and a support team travelled to Germany in a Japan Airlines DC-8; car number 18 was driven by Nobuo Koga, Masami Katakura and Yoshimi Katakura, with no.19 being piloted by the all-Belgian line-up of Jean-Pierre Ackermans, Yves Deprez and Leon Dernier. The race cars featured some improvements, with an extended wheelbase, a larger front grille and a (20bhp more powerful) 130bhp version of the 982cc twin rotor engine. In addition, there were improved brakes and a five-speed manual gearbox. Both cars ran until the 80th hour, in fourth and fifth positions, before no.18’s axle broke. That failure was latterly attributed to a hole having been drilled for a measuring instrument, fatiguing the axle and robbing Mazda of a dream two-car finish. The remaining no.19 Cosmo would complete the race over 344 laps, coming fourth behind a pair of Porsche 911s and a Lancia Fulvia, and beating some very serious competition. It would be one of 26 finishers out of 51 starters – not bad for Mazda’s maiden endurance outing. The changes made to those race cars would be incorporated into the production Cosmo. The Series II cars now came with the same 15-inch stretched wheelbase, which not only increased stability but also improved the interior space. The Series II also gained the more powerful 10A twin-rotor 130bhp engine and improved brakes. There are two Cosmos IIs here today at Mazda’s Classic – Automobil Museum Frey in Augsburg, Germany. One is parked inside the museum itself, and the other is the star attraction outside in the cobbled yard. The tiny, white coupé looks impossibly small, even here among a collection of rare, unusual classic Mazdas that will be joining it on a drive through the Bavarian countryside. The Cosmo’s styling is a curious mix of contemporaneous 1960s European and American signatures, its purity of line punctuated by more overt flashes of flair. The chrome bumper dissects the slightly recessed taillights, giving a look reminiscent of period Americana yet built to a more Japanese scale. While the headlights are in the style of a miniature E-type, the scalloped line firing off the top of the front wheel is a signature that’s echoed in current-model Aston Martins – arguably more successfully than in the Brit. It’s a pretty car, then, with neat detailing and more than a whiff of the futurist space age about it, all in a compact, light package. It’s tight getting into the cabin. You sit low, with a beautiful Nardi Torino wooden-rimmed steering wheel ahead of clear, simple white-on-black instruments. There are toggle switches and a cool map-reading light, while the rev-counter spins up to 7000rpm, at which point the orange line from 6500rpm becomes red. The speedometer reads up to 240 km/h, but that’s somewhat optimistic when the optimum speed is quoted as 126mph (around 203km/h). 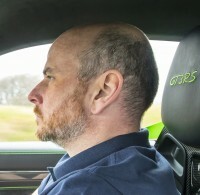 That 130bhp is produced at the top of the 10A twin-rotor’s band, and shifting a kerbweight of just 940kg this results in a 0-62mph sprint of 9.8 seconds. It’s performance that’s merely brisk today, but was comparable with its rivals in 1968. It starts reluctantly, the rotary engine needing persuasion to fire up. There’s a fair bit of smoke, too – not surprising given the engine’s appetite for oil. Once it’s got some heat in it and is idling, it chatters away with an amusing rasp. Both this, and the hedonistic whiff of fuel and oil, will be a constant accompaniment on the drive today. I’m taking part in a regularity trial with all vintages of Mazdas, many of which I’ll unashamedly admit I have zero knowledge about. The world of classic Japanese machines is a rarefied one that, outside their native market, appeals to a small, expert and somewhat fanatical audience. That, and the Cosmo’s rarity, explains the model’s relative obscurity in the classic car world, despite its pioneering tech and that incredible showing in the 1968 84-hour race. Today’s 120-mile route flows through the Bavarian countryside, taking in the Mickhausen Hillclimb, which is Germany’s southernmost such venue. Hillclimb is a bit of a misnomer, as it rises only a mere 76 metres over its 1.3-mile course. That lack of a gradient isn’t unwelcome in the Cosmo, however, as that car’s deficit of torque – just 103lb ft peak at 5000rpm – means it needs plenty of revs to make decent progress. Making brisk progress requires some commitment. The engine revs with real enthusiasm, but the buzzing mechanical sound as the revs quickly rise does not correspond with a huge increase in speed. It’s not dissimilar in effect to driving a CVT, where the revs seem out of sync with the progress –¬ although it’s the Cosmo’s engine that’s unconventional, rather than the transmission. Progress needs to be maintained, and fortunately this is aided by the car’s good ride on the 15-inch wheels, the gearbox’s crisp shift, and the steering’s accuracy and fine weighting. With their positive feel and strong effect, the brakes are a surprise – this isn’t always the classic car norm. They feel more than up to the task of washing off the speed, only for me to start the process of generating it all over again. There’s some characteristic precision in the controls – elements of Mazda’s obsessively detailed engineering that resonate today. In short, the Cosmo is not just beautiful to look at, but it’s a joy to drive, too. That it’s not more widely known or recognised is a surprise. It fulfils so many tick-boxes for classic car superstar status: being a first; technically interesting; a bona-fide competition car – in the most gruelling of races; and achingly pretty as well as rare. That under-the-radar status could well change – and, arguably, should. 1999 mazda mx5 sports, grey, black hard top, long mot, 1.8 engine, 6 speed box, LSD, clean condition , good runner....£1995....ring for full details...07495211192.